Despite so many threats to their health, states are failing to protect our ocean waters. No-take marine protected areas are the gold-standard for healthy oceans, but far too few states and territories are designating them. SeaStates measures the percentage of state’s waters they strongly protect. Being free from fishing, oil drilling and other extractive uses allows marine life in no-take marine reserves to thrive and recover their former abundance. That’s crucial because marine animals and plants maintain healthy oceans essential to people. As coastal areas face increasing overfishing and climate change, strong marine protected areas maintain biodiversity, fisheries and coastal economies. Dozens of studies show that no-take marine reserves provide more effective protection than weaker protected areas, often providing an overflow of marine life into surrounding waters. Many marine scientists recommend designating at least 20% of state waters as no-take areas as the best way to sustain ocean health. SeaStates shows that 15 coastal states (AL, AK, CT, DE, GA, LA, MD, MA, MS, NH, NJ, NY, RI, SC, TX) out of 23 have no (zero) no-take areas. Six states (FL, OR, WA, NC, VA, and ME) have designated barely 1% or much less of their coastal waters as no-take areas. 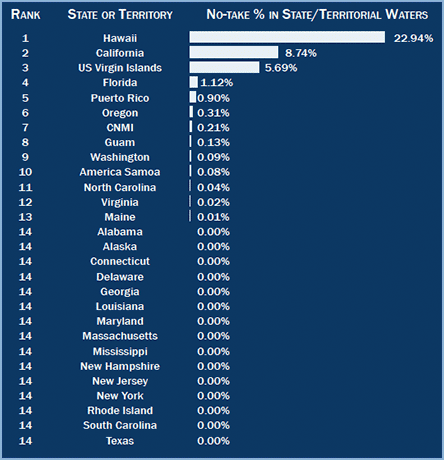 Only 2 states strongly protect over 5% of their waters in no-take reserves. Hawaii ranks 1st for ocean protection with 22.9% fully protected (most inside the Papahanaumokuakea Marine National Monument), while California ranks 2nd with 8.7%. SeaStates shows that very few places are getting the protection they need and most states are doing a very poor job of safeguarding your oceans. It’s time for that to change. Seabirds, whales, groupers and deep sea corals all need refuges where we do everything possible to protect them. The science team at Marine Conservation Institute compiled SeaStates using MPAtlas.org, the world’s best information source on marine protected areas.